Sherrie Scraps with passion: Green Blend Award! Here are the terms which this "Green Blend Award" are to be given. 1.) This award is for any co-blogging friend who has helped your blog in any and all ways. 2.) This award is for any co-blogging friend who has cheered you along in your blog building, craft advancing career. 3.) This award is for any co-blogging friend who always stops by and is kind to you. you can count on them to always be one of the great comments at the end of your posts. 4.) This award is to be given to 3 to 5 Blends whom you feel meet the listed requirements. 6.) 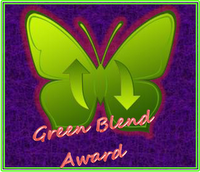 Blend of choice may copy the award from your blog and proudly post it on theirs. 7.) Blend of choice may continue the kindness by issuing this award to keep the circle forever growing. Thank you all for your support and encouraging words. You inspire me to continue to craft and share my projects. Thank you for your amazing friendship!!! Thank you so much for the award Sherrie! I am very honored that you chose me and my blog! P.S. I got my gift card and wanted to say thank you so much again! Have a great day! You made my day, sweet friend! Congratulations, Sherrie!!! And to your wonderful friends receiving it!!! Congrats on the award!! Congrats to ladies you passed it along to as well. Congrats on the award Sherrie! Congratulations, my talented friend!!! You deserve every single award. :o) You are such a blessing in this crafty community! Congratulations Sherrie and thank you for thinking of me.I feel very honoured to count you amongst my blends.Thanks for your friendship. Congrats on your award and thanks for thinking of me! Thank you so much, Sherrie! How kind of you to think of me and pass this along my way! I truly am touched by your kindness - for this and since we've met in blogland. You really are a "blend" of mine! !